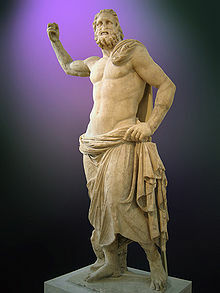 Poseidon or Posidon (Greek: Ποσειδῶν, gen: Ποσειδῶνος) is ane o the twal Olympian deities o the pantheon in Greek meethologie. His main domain is the ocean, an he is cried the "God o the Sea". Addeetionally, he is referred tae as "Yird-Shaker" due tae his role in causin yirdquauks, an haes been cried the "tamer o horse". He is uisually depictit as an aulder male wi curly hair an beard. The name o the sea-god Nethuns in Etruscan wis adoptit in Laitin for Neptune in Roman meethologie; baith wur sea gods analogous tae Poseidon. Linear B tablets shaw that Poseidon wis veneratit at Pylos an Thebes in pre-Olympian Bronze Age Greece as a chief deity, but he wis integratit intae the Olympian gods as the brither o Zeus an Hades. Accordin tae some fowklear, he wis savit bi his mither Rhea, who concealed him amang a flock o lamb an pretendit tae hae gien birth tae a cowt, whilk wis devoured bi Cronos. Thare is a Homeric hymn tae Poseidon, who wis the protector o mony Hellenic ceeties, awtho he lost the contest for Athens tae Athena. Accordin tae the references frae Plato in his dialogue Timaeus and Critias, the island o Atlantis wis the chosen domain o Poseidon. ↑ 2.0 2.1 Burkert, Walter (1985). Greek Religion. Cambridge, MA: Harvard University Press. pp. 136–39. ISBN 0-674-36281-0. ↑ The story of Atlantis. Retrieved October 02, 2012. ↑ Plato (1971). Timaeus and Critias. Lunnon, Ingland: Penguin Books Ltd. p. 167. ISBN 9780140442618. Wikimedia Commons haes media relatit tae Poseidon.